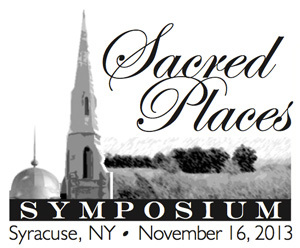 The Preservation Association of Central New York today announced that it will present the first ‘Sacred Places Symposium’ on Saturday, NOVEMBER 16th, at St. Paul’s Episcopal Cathedral, at 310 Montgomery Street in Syracuse, New York. This one-day event will address the many challenges and opportunities associated with some of the region’s most culturally and architecturally valued buildings and places – including insights and case studies on assessing, maintaining, funding, and reusing religious properties and sacred sites. This informative Symposium will bring together an array of expert practitioners to discuss (in two learning tracks) the issues that can determine the fate of these magnificent community places, and the neighborhoods that surround them. Featured speakers will include experts in the preservation and planning fields, including A. Robert Jaeger, Co-Founder and President of Partners for Sacred Places, who will give a keynote address on the importance of protecting, preserving, and repurposing our Sacred Places. Mr. Jaeger is the co-author of Sacred Places at Risk (1998) and Strategies for Stewardship and Active Use of Older and Historic Religious Properties (1996), author of Sacred Places in Transition (1994), and editor (from 1985 to 1989) of Inspired, a bi-monthly magazine with news and technical articles on religious property preservation. There will be a registration fee for the all day symposium which will be offered to the general public, with a discounted fee to PACNY members. Membership options are available at www.pacny.net. Additional information about the Preservation Association of Central New York and the upcoming ‘Sacred Places Symposium’ can be found at pacny.net.